Scented candle gift explore the connection between fragrance and your moods. Home fragrance lovers are often fascinated by the link between candle scents and moods. Aromatherapy is the practice of using essential oils to promote physical and mental well being. If you enjoy burning scented candles in your home, a basic knowledge of aromatherapy can help you get the maximum benefits from your favorite votive, pillar, or jar candles. Bliss: Tangerine and vanilla are great fragrances to promote a happy, relaxed, and calm state of mind. Concentration: Do you have a big project that needs to be completed? Burn a cinnamon candle to promote creative thinking or choose eucalyptus scented products to enhance mental focus. Energy boost: Next time you're feeling tired, look for candles with pine, clove, peppermint, lemon, or patchouli scents to fight fatigue. Peace: Burn a candle that combines violet leaf and lemongrass during your yoga session to promote feelings of peace and tranquility. 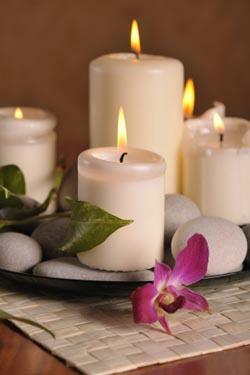 Romance: Set the mood for a hot date by choosing candles with patchouli, orange, or Ylang Ylang scents. Need a boost of courage to face your crush? Try adding a clove scented candle to the mix. Stress relief: If you're feeling stressed, select candles with rose, lemon, orange, lavender, sandalwood, vanilla, or honeysuckle. Frankincense, clary sage, chamomile, and sandalwood are also recommended for helping to alleviate mild symptoms of depression. Additionally, you may want to keep in mind that candle scents can be used to set the mood for a party. If you're having a summer BBQ, a nice citrus or lemonade scented candle will get your guests in the mood for fun. For a Christmas celebration, evoke happy winter memories by burning candles with apple, berry, pine, cinnamon, or sugar cookie fragrances. While this may not technically qualify as aromatherapy, it's a simple way to add a special touch to your event. Should You Make or Buy Your Candles? If you're interested in the link between candle scents and moods, you may find yourself wondering whether you should purchase your candles or learn how to make your own. Obviously, buying candles is more convenient, since you can simply walk into the store and purchase whatever size or scent you desire. The Yankee Candle Aromatherapy Spa line offers many different products to influence your moods. Many specialty gift shops also offer a nice selection of aromatherapy soy candles. On the other hand, when you make your own candles, you have complete control over the final product. You can create your own customized blend of fragrances or put the candle in a unique glass container that perfectly matches your home décor. Additionally, making aromatherapy candles is often a more economical option. When you buy your supplies in bulk, you can create several candles for a fraction of the cost of one large jar candle at your favorite specialty shop. For more information, please see the LoveToKnow Candles articles on Aromatherapy Candle Making and Aromatherapy Candle Making Recipes. Use these items with your favorite candles to transform your home into an oasis for mind, body, and spirit.